Your first orthodontic visit sets the stage for a lifetime of improved oral health. The orthodontists in our Sugar Hill family orthodontics practice promote the American Association of Orthodontists recommendation that children receive their first orthodontic evaluation by age 7. These visits are complimentary at our office. While this might seem young to consider treatment, it’s important to understand that in most cases, no treatment is necessary at this age. 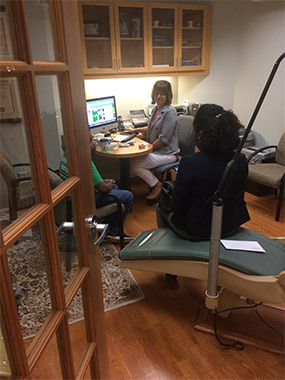 This first visit is simply a time for one of our orthodontists to evaluate your child’s bite and take a look at the mixture of baby and adult teeth to make sure the adult teeth have enough room to erupt. We invite you to visit our early treatment page to learn more. Whether you are a parent bringing your child for treatment, or an adult seeking treatment, the first orthodontic visit is the same. Your first appointment for a complete evaluation is complimentary. We begin by gathering a comprehensive medical and oral health history. You can complete this paperwork in our office, or feel free to complete our new patient paperwork prior to your visit. Our next step is to take a full set of digital panoramic and cephalometric X-rays, as well as photographs. This helps our orthodontists understand your dental and skeletal relationship. Photographs of your face and teeth will be taken, as well as impressions, which are used to create a model of your teeth and bite. One of our orthodontists also will conduct a full examination of your mouth and face, and will observe the way your teeth fit together and function. Once we have all of this information gathered, we will develop a treatment plan geared to your specific orthodontic needs. We also will share treatment costs and assist you in creating a payment plan that best suits your needs. Our knowledgeable staff will work with you to help you maximize your dental insurance benefits. Please call us today if you would like to schedule your initial examination.